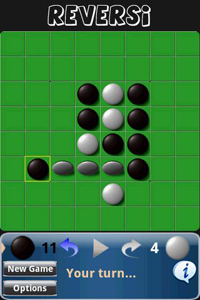 I stumbled upon this reversi game, Deep Green Reversi, which runs on Android. 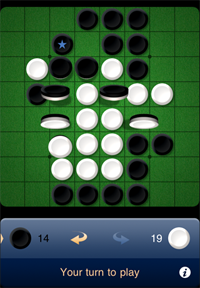 The graphics in the game, in particular the status bar under the board and the menus look very similar to Reversi on the iPhone. 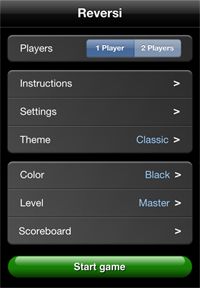 Furthermore, the game description for Deep Green on the Android market is an almost verbatim copy of the description for Reversi on the App Store, with 'iPhone' replaced by 'Android'. 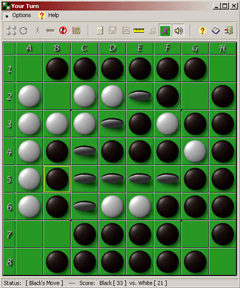 The graphics of the board and pieces look remarkably similar to a much older game, also called Deep Green Reversi, for Windows, which doesn't seem to be connected to the Android version. 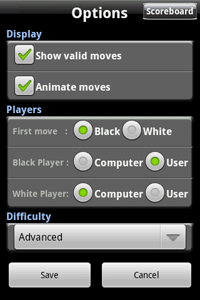 I don't know how the game play of Android Deep Green compares to the Windows version or to Reversi on the iPhone. Should I, or the author of the Windows version be bothered about this, or simply be flattered that the author of the Android version thought that aspects of our implementations of the game were good enough to copy? Seems he can't even be bothered (or isn't capable of) doing a decent job aping the originals, let alone creating his own artwork and copy. I wouldn't lose sleep over a poor imitation Michael. This guy, Gavin Sumark thought it would be a good idea to steal one of my (OLD) screenshots to promote his game (which I'm informed is a rip-off of this MM Reversi written by Matthias Metzger). The Android Market place is fast becoming a breeding ground for wide-spread copyright infringements like this.